Several days ago, PURRS-Naperville donated a couple of hundred cases of Sheba canned cat food to Feral Fixers, for which we are very, very grateful. Today at PAWS, we swapped some of that canned, wet, cat food for some dry Iams diet cat food. 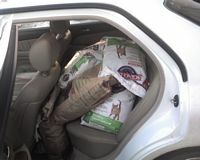 I then drove the dry cat food to the home of one of our colony caretakers who will use it to feed the multiple colonies she watches over. This is a classic 'win-win' situation; PAWS needed this fancy, tasty cat 'junk food' (meant in the best sense of the word ☺) to feed their finicky cats while the feral cat colony managers need the dry food because it doesn't freeze up in the cold weather we're having. I love it when it happens like this; everyone helping each other, no one looking for special favors or credit, all of us working together to a) help end the problem of cat overpopulation and b) help take care of the feral cats that are out there so that they may have a better quality of life.